Open Development and Design focuses on design guidelines for new musical instruments. Over the course of several iterations, concepts and ideas develop into refined functional design prototypes. This process is inspired by research conducted in the other research fields of 3DMIN, as well as in collaborations with external artists and performers. Each iteration includes design, prototyping and evaluation phases, which ensures that the knowledge gained in earlier steps feeds back into the project. 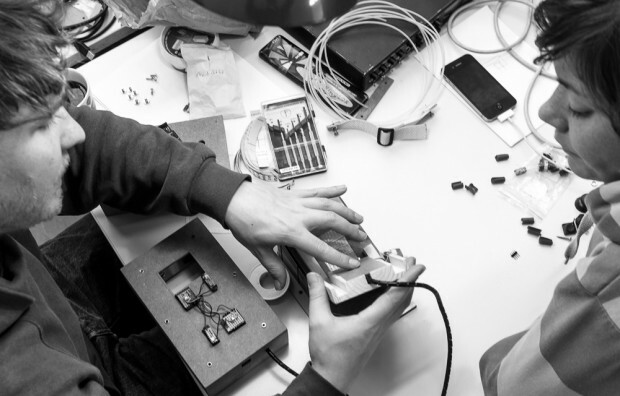 With PushPull, a first prototype instrument was build and tested in several performances. Further, steps towards the musical integration of algorithms, sound, dance and choreography were made. The team behind this project forms an expert group within the fields of interpretation / professional music making, composition, product as well as interaction design and music technology. In the tradition of Humboldt’s education ideal, the gained knowledge is directly applied and tested within active discussions in an interdisciplinary course open for students of both, UdK Berlin and TU Berlin.